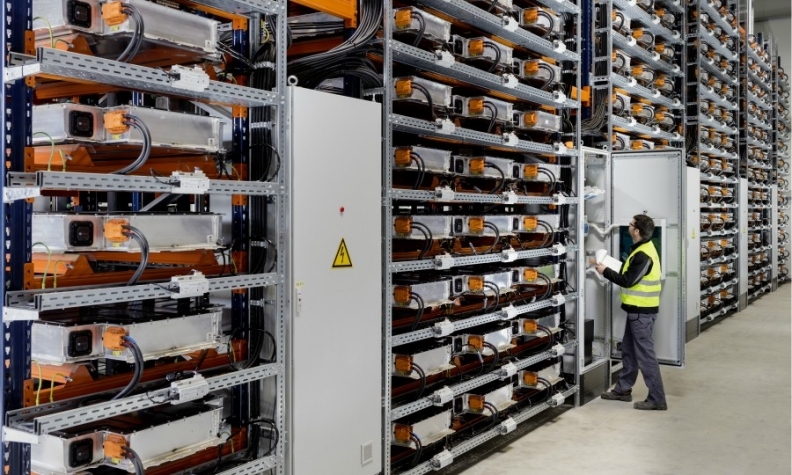 A worker checks batteries at BMW's Storage Farm in Leipzig, Germany. MUNICH -- BMW Group is tapping its own wind turbines and recycled batteries to power machines that make cars such as its i3 EV, adding a new shade of green to the production chain. The carmaker is linking 700 "second-life" i3 electric-car batteries to store power from four wind turbines located at its so-called Storage Farm in Leipzig, which will help it build vehicles at the factory, the automaker said Thursday in a statement. The move to link wind power with old EV batteries is aimed at helping BMW shave its demand for electricity at peak times at its factory in Leipzig. It's both meant to protect the environment and shift BMW toward EVs. The company may expand the project, including adding more turbines. The decision on expansion "remains open," BMW CEO Harald Krueger told reporters in Leipzig. The linked batteries and storage management mean the company has the ability to store energy, he said. The project is scalable and helps making the harnessing of second-life batteries profitable, Kruger said. BMW will also sell excess energy onto the grid. Current storage capacity is enough to power 50,000 households for one month. BMW's i3 plant is a "blueprint for us," said Joachim Koller, BMW's head of energy services at the same event. The company on Thursday celebrated the roll-out of the 100,000th i3 from the Leipzig plant. BMW hopes to become the leading producer of premium electric vehicles, with plans to add the i8 plug-in hybrid Roadster to its fleet. The automaker has said it will offer 25 electrified vehicles, including 12 EVs, by 2025 as it joins other rival automakers such as Volkswagen Group and Daimler in expanding its electric lineup.